This picture of my oldest grand daughter does not have anything to do with today’s recipe. I just love it so very much. Mr. Gravy was watching this older runt (yes, he let her play in the mud) while I was with the little runt. Their parents were trying to watch the older brother play baseball. 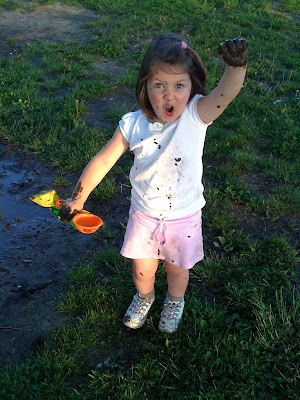 When I saw this girl in the mud, I wanted Mr. Gravy to get a picture of her. He’s the one in the family with the iPhone that takes the clearest pictures I’ve ever seen. Every time this picture pops up on my laptop screen, I start laughing. My eyes want to tear up every time. If I put it here, I can see it even more often. It’s one of those pictures that needs no caption. I started to do this recipe for the blog back in February. Life happened and I was sidetracked. Nothing drastic or horrible…just life. Grand kids, family, art projects, and the neighborhood garage sale. Also, my computer. As I was starting to download the pictures, my hard drive maxed out. Don’t you just hate that? Anyway, I had to archive about three thousand of my favorite pictures from the last three years. I am pretty sure this happens to other people. It hasn’t happened to anyone I know, but then, my friends are not as attached to their laptop and camera as I am. This recipe is pretty good. It is colorful when you need a dish to pack a punch of color. I have also discovered, much to my surprise, that a lot of kids like this. Who knew? Zest the orange first. I use what zest I need, then put the rest in a baggie and put it in the freezer for future use. Juice the orange. If there is any juice left from what you use in the recipe, drink it. I love fresh squeezed orange juice. See the juicer and the measuring cup? I found those at a flea market and just love them. My mom and my grandma both had stuff like that. Put all of the ingredients into a skillet and bring to a boil on medium high heat. When it comes to a boil, reduce the heat down and let it simmer until tender. It will take about twenty minutes. If the carrots need more cooking time, put a lid on the pan and simmer until they are as done as you like. I like my carrots cooked rather soft. That way, more of the buttery, sugary goodness gets cooked in. They really are orange carrots! Enjoy. This entry was posted in Carrots, Orange Carrots. Bookmark the permalink.